Best selling business authors Martha Rogers, PH.D. and Don Peppers have devised a new way for companies to measure and track the value of a business' sole source of income: the customer! "Return On Customer"
details the creation and implementation of this new metric that allows organizations to create maximum benefit from their scarcest resource. Within this sixty minute program, viewers will not only learn how to determine Return On Customer, but also how to incorporate this measure with Return On Investment to determine optimum strategies for the future of their businesses. Martha Rogers and Don Peppers use concrete examples to illustrate the ways that companies increase their value over time, while creating a corporate culture that rewards the development of an operating philosophy focused on the customer's point of view. 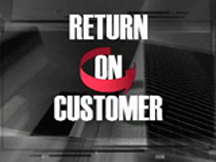 Touching on areas as diverse as technology, morality and economics, Return On Customer carries a positive message for everybody, including business decision makers and consumers.